Having a truly modular system inside a DAW offers some tantalizing possibilities. It means, in theory at least, you can construct whatever you want from basic building blocks. And in the very opposite of today’s age of presets, that could make your music tool feel more your own. Oh yeah, and if there is such an engine inside your DAW, you can also count on other people building a bunch of stuff you can reuse. Why modulaity? It doesn’t have to just be about tinkering (though that can be fun for a lot of people). A modular setup is the very opposite of a preset mentality for music production. Experienced users of these environments (software especially, since it’s open-ended) do often find that patching exactly what they need can be more creative and inspirational. It can even save time versus the effort spent trying to whittle away at a big, monolithic tool just go get to the bit you actually want. But the traditional environments for modular development are fairly unfriendly to new users – that’s why very often people’s first encounters with Max/MSP, SuperCollider, Pd, Reaktor, and the like is in a college course. (And not everyone has access to those.) Here, you get a toolset that could prove more manageable. And then once you have a patch you like, you can still interconnect premade devices – and you can work with clips and linear arrangement to actually finish songs. With the other tools, that often means coding out the structure of your song or trying to link up to a different piece of software. We’ve seen other DAWs go modular in different ways. There’s Apple Logic’s now mostly rarely-used Environment. FL Studio has a Patcher tool for chaining instruments and effects. There’s Reason with its rich, patchable rack and devices. 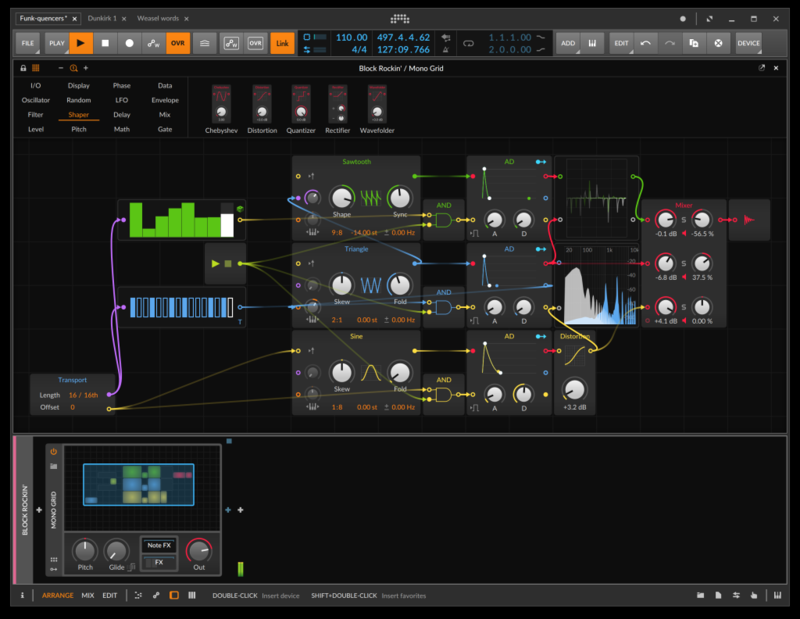 There’s Sensomusic Usine, which is a fully modular DAW / audio environment, and DMX lighting and video tool – perhaps the most modular of these (even relative to Bitwig Studio and The Grid). And of course there’s Ableton Live with Max for Live, though that’s really a different animal – it’s a full patching development environment that runs inside Live via a runtime, and API and interface hooks that allow you to access its devices. The upside: Max for Live can do just about everything. The downside: it’s mostly foreign to Ableton Live (as it’s a different piece of software with its own history), and it could be too deep for someone just wanting to build an effect or instrument. Updated: A commenter rightfully points out that I omitted MUX Modular, in MuLab. Indeed, that approach is similar – as you can read in the modular docs, you get building blocks integrated inside the DAW. So, enter The Grid. This is really the first time a relatively conventional DAW has gotten its own, native modular environment that can build instruments and effects. And it looks like it could be accomplished in a way that feels comfortable to existing users. You get a toolset for patching your own stuff inside the DAW, and you can even mix and match signal to outboard hardware modular if that’s your thing. And it really focuses on sound applications, too, with three devices. One is dedicated to monophonic synths, one to polyphonic synths, and one to effects. From there, you get a fully modular setup with a modern-looking UI and 120+ modules to choose from. You can patch anything to anything, in to out. All signals are interchangeable – connect any out to any in. Most other software environments don’t work that way, which can mean a steeper learning curve. (We’ll have to see how this works in practice inside The Grid). Any in can go to any out – reducing some of the complexity of other patching environments (software and hardware alike). Everything’s stereo. Here’s another way of reducing complexity. Normally, you have to duplicate signals to get stereo, which can be confusing for beginners. Here, every audio cable and every control cable routes stereo. Everything’s also in living stereo, reducing cable count and cognitive effort. There are default patchings. Funny enough, this idea has actually been seen on hardware – there are default routings so modules automatically wire themselves if you want, via what Bitwig calls “pre-cords.” That means if you’re new to the environment, you can always plug stuff in. They’ve also promised to make phase easier to understand, which should open up creative use of time and modulation to those who may have been intimidated by these concepts before. “Pre-cords” mean you can easily add default patchings to get stuff working straight away. What fun is a modular tool if you can’t explore phase? Bitwig say they’ve made this concept more accessible to modulation and easier to learn. There’s also a big advantage to this being native to the environment – again, something you could only really say about Sensomusic Usine before now (at least as far as things that could double as DAWs). Route modulation out of your stuff from The Grid into other Bitwig devices. With phase, sync, and pitch inputs on most every oscillator, there are many opportunities here for complex setups. Providing this additional bandwidth keeps most any patch or experiment from audible aliasing. As an open system, this type of optimization works for the most cases without overtaxing processors. It’s stereo only, which puts it behind some of the multichannel capabilities of Reaktor, Max, SuperCollider, and others – Max/MSP especially given its recent developments. But that could see some growth in a later release, Bitwig hints. For now, I think stereo will keep us plenty busy. This is something we worked a lot on in early development, particularly optimizing performance on the oversampled, stereo paths to align with the vector units of desktop processors. In addition, the modules are compiled at runtime for the best performance on the particular CPU in use. That’s a big deal. I’m also excited about using this on Linux – where, by the way, you can really easily use JACK to integrate other environments like SuperCollider or live coding tools. If you’re at NAMM, Bitwig will show The Grid as part of Bitwig Studio 3. They have a release coming in the second quarter, but we’ll sit down with them here in Berlin for a detailed closer look (minus NAMM noise in the background or jetlag)! Oh yeah, and if you’ve got the Upgrade Plan, it’s free. Yeah, personal life / sleep … in trouble.